I had every intention of making lasagna for dinner this weekend. I even went through the pantry and freezer to discover what I actually had on hand. However, when it came time to head to the store, I really didn’t want lasagna; just could not see making it. So I decided to make enchiladas instead. I tried an Indian dish too, but that is for another day. 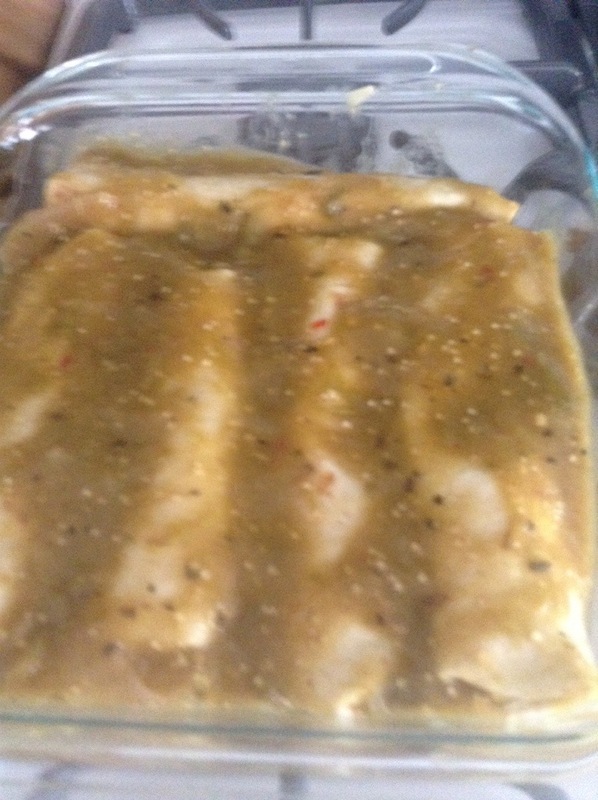 when I do chicken enchiladas I do a green sauce with them. I’m not sure why but I always do verde for chicken and red sauce for pork. 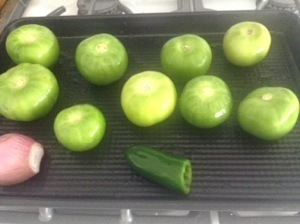 I start with tomatillos and, as usual, I have to explain what they are at the grocery. I don’t buy them often but every single time I’ve gotten then the cashier had no clue what they were. This week they were brussel sprouts. Go figure. But I digress. 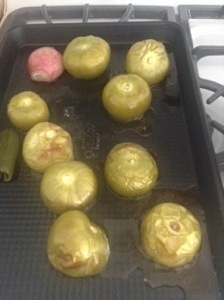 Six to ten tomatillos, one shallot, one to two jalapeños (seeded). I rub these with a little oil then toss them in a 350 degree oven for 25-30 minutes on on the grill for 10-15. You know they are done when they are blistered and beginning to give up the juice. I know there is a whole bunch that I should do here, but really, I toss everything into a food processor with a teaspoon of cumin, pinch of salt and maybe another chili. Blend well and done. I don’t worry about the parts that don’t blend – I just remove them as I go. While the tomatillos are roasting, cook one chicken breast or three to four thighs in a pan with a little water and cover. Just cook through and then let cool before shredding. Also caramelize an onion. It doesn’t have to be fully caramelized, but you want the sweetness to come through. I went a little more than this picture, maybe a total of 30 minutes. 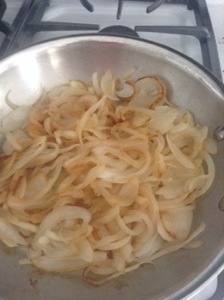 And despite what some recipes say, you cannot truest caramelize onions in ten minutes. You just can’t. Once the sauce is made, the chicken is shredded and the onions are caramelized it’s time to assemble. You want two kinds of cheese here. Shredded. I use what is on hand, so in this case the sheep cheese from the cheese box this month and the Comte for the top. I’ve used a variety of cheeses in the past and most of them work really well. Just make sure it melts nicely. This is going to seem like a silly step, but trust me, don’t skip it. 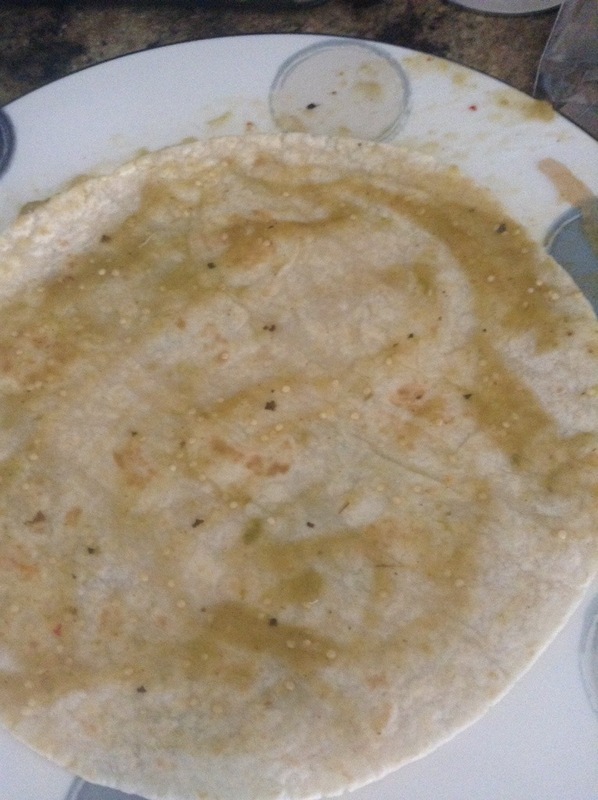 Coat both sides of a flour tortilla with the sauce. Yes, both sides. If you don’t bad things happen in the oven. You also want to coat the bottom of your pan with sauce to prevent sticking. Again, don’t skip this. 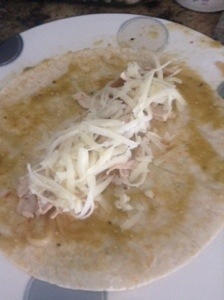 Load your tortillas with onion, chicken then cheese and roll, tucking the ends in as you go. Repeat until you have a small pan full. 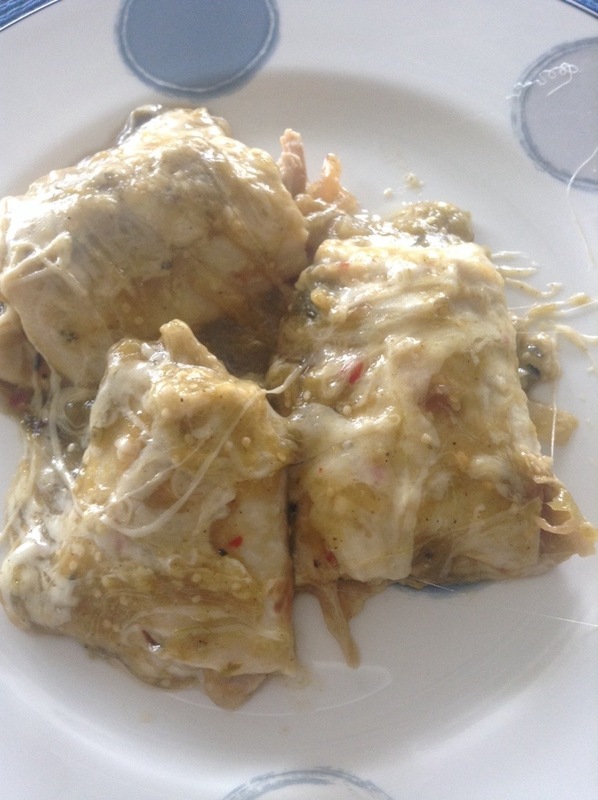 I was able to make five enchiladas with three chicken thighs and one onion. And lots of cheese. Lots. 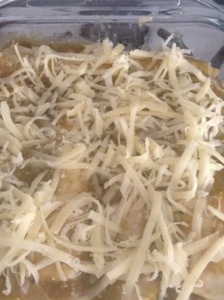 Cover with the remaining sauce and the other type of cheese. Cover with foil and bake at 350 for 25-30 minutes. Let stand three minutes or so before cutting and serving. It isn’t the world’s prettiest or most colorful dish, but it is darn good. If it was just me, I’d skip the chicken and add peppers but Bob likes this version so I go with it. In my seemingly never ending quest to survive testing season with my brain somewhat intact I keep trying new things. I’ve added my 15 minutes of yoga back in each morning (and try to get in a half hour each night) not because it does a ton to get me in shape, but it makes me feel better; less stressed and not as irritable. I try to eat during the day even it if it a few snacks and walk Jessie in the evening. I’ve got a book to read (new neurscience book with a focus on how the brain learns) to read and I am in a better place this year than I was last year. I do attribute some of this to my having taken care of dinner with my boxes. Right before testing started this month I decided to add to my Hello Fresh boxes with a box from Blue Apron for a few weeks. This way, I have six meals each week taken care of without having to eat out or plan and shop. I also wanted to compare these two services and I think I have enough information now to make a pretty fair comparison. Before I get to the actual food, there are some differences in the picking and getting your meals. The Blue Apron website is easier to navigate and see what each week’s meals are; Hello Fresh use to be pretty each when I first started, but they did a site redesign a month or so ago and it is much more difficult now. Blue Apron also lets you pick your delivery date (for me, Wednesday, Thursday or Friday) whereas Hello Fresh has one day (Wednesday) for delivery. 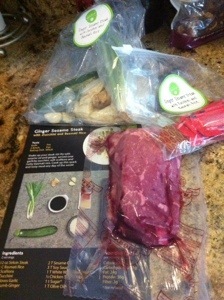 However, Hello Fresh does let me pick my actual meals. Since I get the classic box I can choose three of five recipes. There is usually one fish dish that we swap out for a vegetarian or other meat dish. I can also change to a full vegetarian week if I want to, but again, the choice of what those meals are is cumbersome to find. Blue Apron does not give me a choice. They have six meals each week and they decide what they are sending you based on the proteins you eat. However, if you take out two of the meats that week, you get a full vegetarian selection even if you don’t want it. In reality there isn’t a big difference in the number of choices you have, but Hello Fresh feels like there is more choice and more control. Customer service is also a big thing. In this department Hello Fresh has Blue Apron beat by a mile. I have spoken (via email) to each a few times and I always come away from the conversations from Hello Fresh with a positive vibe. They want customers to be happy and are clearly a growing business. They are extremely helpful and and I honestly can’t think of a company as responsive. Yes, I am gushing about them because their customer service department is that good. 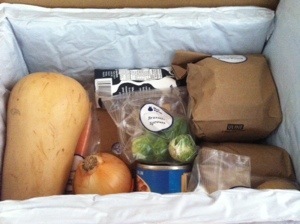 Blue Apron on the other hand makes me feel frustrated. It feels like they do not care if you are happy or not, or if you stay a customer or not. I felt dismissed when I dealt with their customer service department, not helped. This is also not to say that Hello Fresh has always been able to do exactly what I wanted, but their explanations were more customer friendly than a simple no. Cost for each is roughly equal. 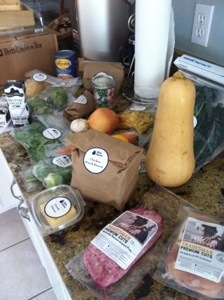 Hello Fresh is a little more each week if you go for the classic box, a little less with the veggie box. Blue Apron is one price no matter what you get each week. The packaging is the same – cardboard box with biodegradable (they say) insulation and ice packs and everything is in the box that you need for three full meals except salt, pepper, olive oil and hardware. Everything. The first real difference is how things are put together. Hello Fresh has great bundles. 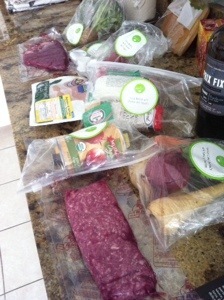 Ingredients are bagged per meal and labeled with which recipe they belong to. Blue Apron has all of the ingredients labeled, but there is no identification as to which recipe each belongs. In the case of some things like garlic and lemons, they may belong to more than one recipe so sorting is more difficult. We are taking about five minutes to unpack and put away the Hello Fresh vs. 25 minutes for the Blue Apron, which isn’t a huge deal, but like the meal choices, it feels like a big difference, especially when your brain is totally fried after work. But the most important thing is the food and cooking the food. 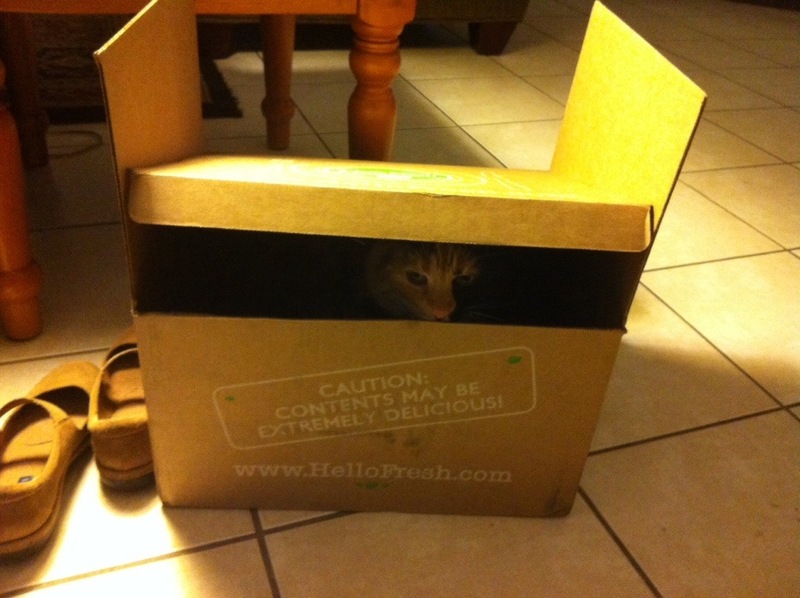 Hello Fresh is exactly what they advertise. They are good quality, fresh ingredients that do last all week. 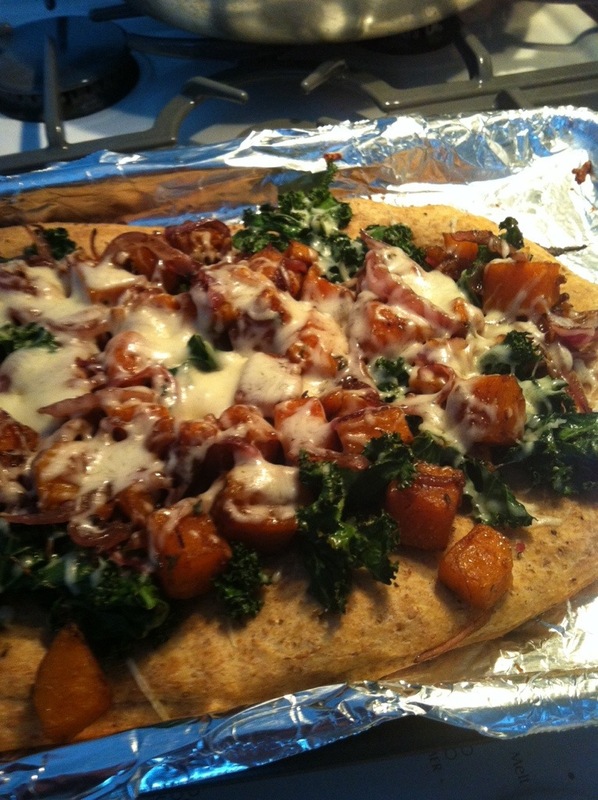 They are pretty simple to put together and the recipes are written for a novice cook. Yes, you need to know the difference between dice and chop, but beyond that little skill is needed. Blue Apron recipes are a little more complex and you should have a little more kitchen skills to follow them. There are more pieces to juggle in the Blue Apron recipes and timing becomes more important. Both take between 30 and 45 minutes to put together and … did I mention they send you everything you need to make these? No more forgetting to get something at the grocery or thinking it is in the pantry when it isn’t. I can successfully cook an entire meal after a full day of testing. In both cases the food is really good and Bob and I have been enjoying trying different things. 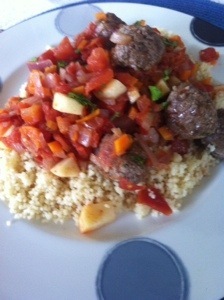 Some of the meals from each are basic and some are very different, but they are all well balanced and tasty. While there have been a few meals that we liked but didn’t love, there has not been any that we would not eat again. I will admit that Blue Apron hit it out of the park with a butternut squash, curried chickpea recipe, but overall I am still happier with Hello Fresh. Yes, for what we tend to eat they are a little more each week, but to me it is money well spent. 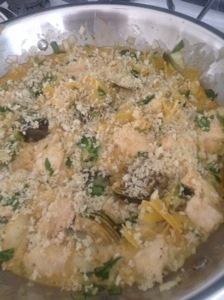 I am thrilled with the quality of the ingredients and the ease of use from picking meals to unpacking to actual cooking. Hello Fresh also sends me a survey each week wanting to know how I liked each recipe. It isn’t invasive and it is a simple rate the dish and would you like to make any comments survey. But it goes along with making you feel like they are a responsive company and they want to grow and improve. I think that is the biggest difference. Blue Apron feels like a well established company that has a solid base of customers and knows it. Hello Fresh feels (pardon the pun) hungrier for customers and wants them to be happy. For me, they succeeded and I look forward to my Hello Fresh boxes each week. I may give Blue Apron another try here and there, but for the most part, I’ve made my choice. I’m writing this with the fancy new gadget Bob got me this week. He knows I like to write these posts on my iPad (also a present from him) but the typing without a keyboard does lead to more errors than I would like. It is a different feel than typing at work, which is probably a good thing, but he found a new toy. The man does love his electronic toys. 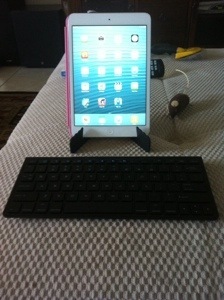 That is a wireless keyboard that hooks to my tablet with bluetooth. I can sit on the floor, type and see what I am writing and how may mistakes I’m making much easier than typing on the tablet. And since I am very, very use to keyboard typing, this goes faster. And it’s new and fun and isn’t that half the excitement?!?! But for the cheese … this month Louise put together a great little box. We have two French cheeses and one from Tennessee. 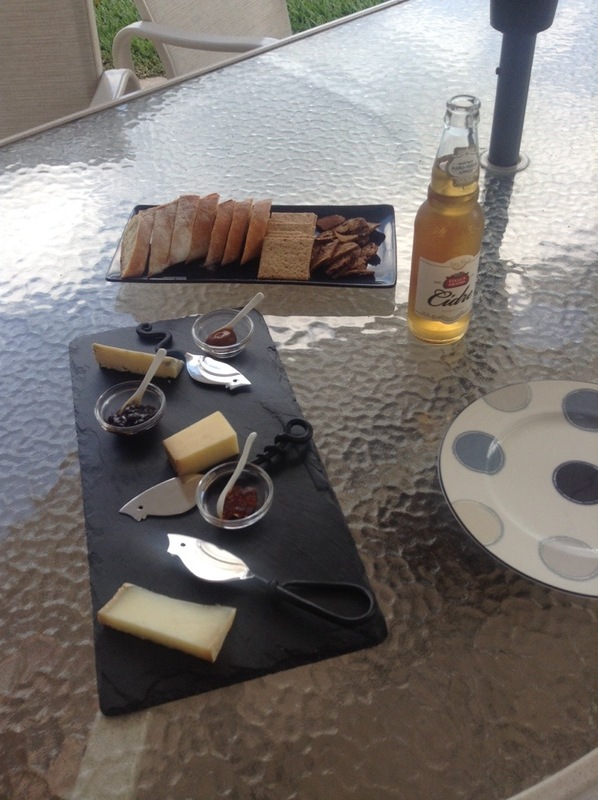 I am partial to sheep cheeses so I was very excited about the Ossau Iraty. With more flavor and nuttiness than most sheep cheeses, this one is a winner and needs to go on the favorite list. Both Bob and I contemplated cutting more after we devoured the first bit we cut off, but I am trying to savor it; lunch this week and all you know. 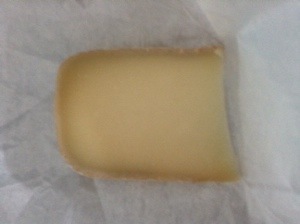 The other French cheese was Comte from the Jura Mountain region of France. This one was good, but not great until we made a grilled cheese sandwich with it. It was National Grilled Cheese Day Saturday and what better way to celebrate than a really good grilled cheese sandwich? 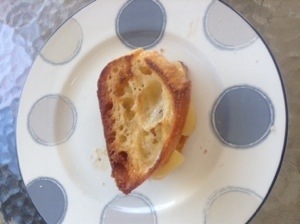 This one is smooth and subtle and when it melts it is the perfect grilled cheese sandwich. Of course, take this as coming from the person who does have a fondness for the processed cheese product that one can obtain in a grocery store. No, it isn’t cheese, but it has its place. Bob was so happy with the sandwich he apparently made one for himself – on the stove – while I was out visiting with Mom and Dad today. I’m not sure I believe him. He has never used the stove before and I wasn’t sure he knew how. But he claims to have made himself a sandwich with the Comte and the Blackberry Farms Blue. This has to be the mildest blue cheese ever. Louise asked me to try it (she knows I don’t do blue and has placed little surprises in our box on occasion when there is a blue in it that month, but this time she was trying to tempt me. So … I looked at it and decided to try some from the very middle where there is no veining. The texture was amazing – smooth, rich and creamy. The blue taste was very mild, the mildest Bob said he ever had. I was ok until the after taste or the back end of the cheese kicked in – then it was all blue. Not spit it out and grab Bob’s water blue, but it was there. I didn’t pucker my face or anything, but it still isn’t for me. I can appreciate this cheese. 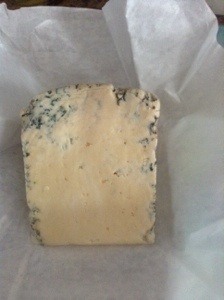 It has to be very difficult to make a cheese that mild and that complex, yet that distinctly blue. I may have to see what else this Tennessee creamy has up its sleeves. Needless to say we had a great little dinner out on the patio with this box. 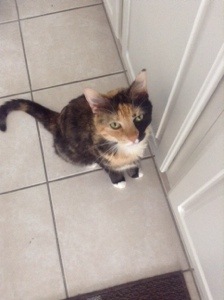 Gracie tried to join us; she tried to convince me in the kitchen that she should have some cheese too, but no, I refrained from this as that would mean Jessie would be looking for cheese too and that is bad for everyone. She is darn cute though and very hard to resist. I’m working through our first Blue Apron box this week and have been taking some notes to compare it with the Hello Fresh boxes we love. 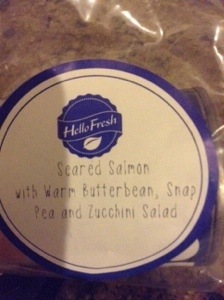 I’m trying to get through the entire box before posting though – I have a bias towards Hello Fresh since they have been so wonderful the last few months; seriously the customer service is amazing and the food is great, so Blue Apron has a lot to live up to. I’ll try and get that up later this week. Hope Spring is arriving for everyone and the flowers are blooming. 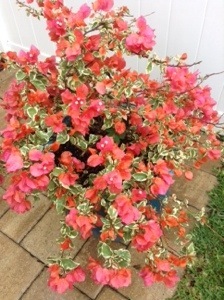 I miss my tulips, but will make due with the pretty flowering plant that I can’t spell on the patio. Last week I began my marathon of testing. When it is all said and done I will have administered 43 tests in 34 days over 7 weeks. This does not include the writing assessments that were given in February, the field test writing test that was administered in December, the ACT PLAN in October or the September or December retakes of the Algebra tests or the October Reading tests. By the end of this school year I will have spent more than 45 days administering tests. In our school we test all students in grades 6-10 in Reading, 6-8 in Math, grade 8 Science, grade 7 Civics and every high school student in Algebra, Geometry, Biology and US History. We also administer, because we are required to by law, the college readiness test to all eleventh graders. We are a typical public school. I got to thinking about this earlier this week as I sat watching students take these tests. I had one student so stressed she ran out of the room to throw up and a second that was in tears by the end of the three hour test session. This student has a 3.8 GPA, takes honors classes, does well in those classes and will attend a four year university after graduation; this student has failed this test by one point three times. I cannot believe these tests accurately test reading skills when situations like this occur. I do defend testing to an extent. High School Teachers have a vested interest in their students doing well. We often see effort reflected in grades more than we should, and we need a way to identify if students are mastering content. But this is not the way. In the past week I have also read more posts concerned with the current state of teaching and testing than I have in a long time. Maybe it is the time of year, maybe I have a heightened sensitivity to this subject right now, or maybe things have really changed as much as I think they have. First was a Massachusetts Pre-K teacher’s letter resigning after 25 years. She spends more time in meetings and being prescribed fixes than she does teaching. She sees the problems with asking students to learn things they are not developmentally ready to learn and she has finally had enough. Next came the NY City Principal of a high performing school. She has the same concerns regarding the standardized tests that I do; the tests, I should note are made by the same company. The title of this op-ed piece is misleading, but the sentiment is one I readily identify with. Another piece on this same issues was from a NY City Teacher. She articulated beautifully how many teachers feel. Part of my problem with this many high states tests is that they fail to account for several factors that will influence scores more than student development, teacher effectiveness or school quality. There is no place to note parent education and income, two factors that are better predictors of test performance than school rating and, depending which study you read, IQ. There is no place to mark that parents are divorcing, a death occurred in the family, a parent lost a job or that the student is working full time and going to school. There is no place to say the student is being evicted from their home or there has been no electricity for a month because the parents cannot afford the bill. There is no place to tell those scoring these tests that the student’s mother is in the hospital or the student was just released from the hospital. I have seen students who usually score “highly proficient” drop to “below average” when one of these events occurs during the school year. Some will bounce back, others will not. It seems to add insult to injury that we judge them and their teachers without all of the information. My other issue with these tests, in addition to what the NYC educators have stated, is that they compare one class to another, not a child’s development and progress over the course of his/her education. A teacher’s rating based on whether this year’s class did better than last year’s class with no regard to where each of those children started. Yes, we can see a child’s progress on the score report, but that is not how teachers and schools are judged. The other education related article that caught my eye this week was one about the difference between reading on line and reading on paper. We teach with paper books and we test on a computer. It isn’t the same task. I want to see teaching go back to the creative inspired profession it once was. I want to see learning and curiosity valued more than the ability to guess correctly on a test. I want developmental experts to say what age children should be taught skills, not politicians and lawyers. I want students to want to know why and how and become curious about the world around them. I want tests to reflect what students know, not how well they learned how to take a test. I’ve had a lot of time to think over the last week and I will have more time in the next six weeks. I’m hoping this testing season isn’t as bad as the last few and that this trend of adding more and more exams will cease soon. A graduation exam is one thing – a lifetime of testing is another. Apologizes for the rant. I’ll be back to food and furry creatures soon, but I just had to do this once. It’s been on my mind a lot this week. A few weeks ago Bob saw the trailer for Captain America and indicated he wanted to see it. I like the Marvel comics and the films that come out based on them, but poor Captain America just doesn’t interest me. So, I called Val and asked if we could set up a “play date” so the boys could see their movie … We could do some shopping. It was a date. So Saturday morning we packed up Jessie and headed over to West Palm. We shipped the boys off to their movie and we went shopping. I desperately needed new jeans. Emmie has commented that one pair I have needs to go because they don’t fit (yes, Emmie, I am still wearing the pair you hated in the fall) and another pair is just plain falling apart. I could also use a few new things for work. So off we went, it was a successful trip and shopping with Val is about one of the only ways I don’t break out in hives thinking about it. Well. Shopping with Val and shopping on line. I even picked up a super cute pair of shoes on line this week … And they fit perfectly. 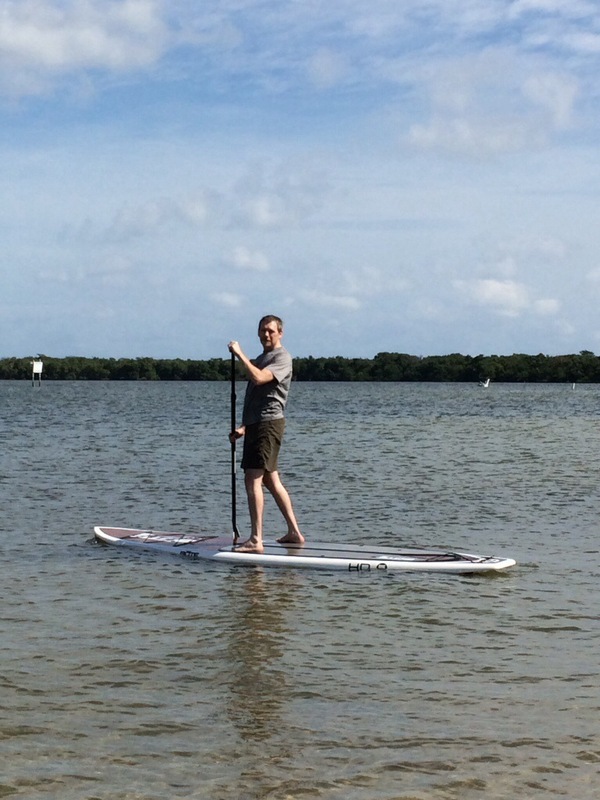 This morning Bill took Bob out on the water for paddle boarding. Val and I were going to yoga, but between my joints and her shoulder, we decided it wouldn't be a great idea. But the boys seemed to have a good time. I also meant to post this recipe a few weeks ago, but just never found the time. I wanted something quick and different. 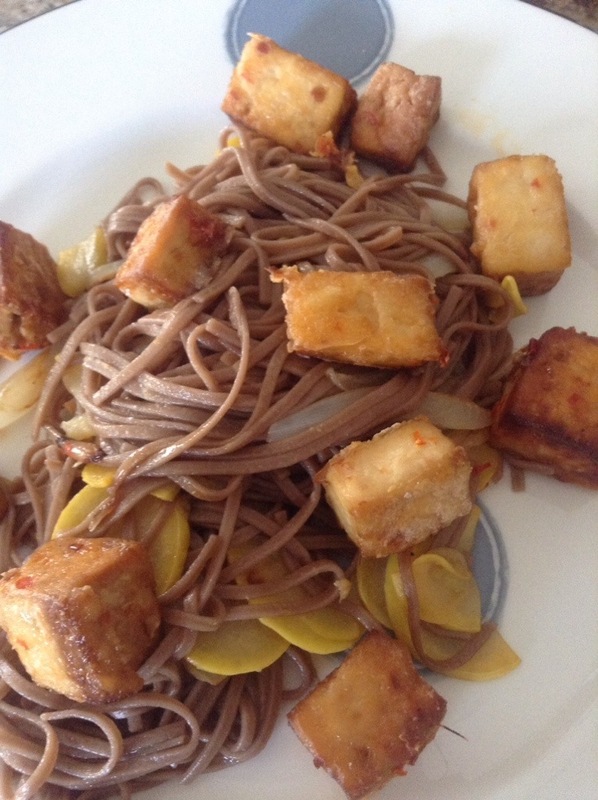 I remembered the soba noodles at Jasmine in Tallahassee and decided to come up with something in that vein. I took peanut oil, soy sauce, honey, sherry vinegar and garlic for the sauce. I cooked the soba noodles and some onion, red pepper carrots and chicken tossed it all together and we had dinner. Bob really liked this one and so did I. It was light but had tons of flavor. I keep meaning to make it again, but lately I stare at ingredients and just can't exactly get it together. 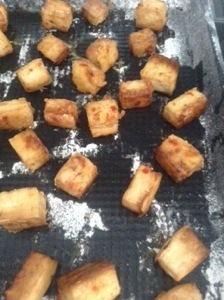 I am making a baked tofu dish for tomorrow. I have it prepped – just have to toss the tofu in the marinade before work then make it with some squash and noodles when I get home. Hopefully I can get it together to do that. I also came up with what may be the laziest approach to dinner I can think of. Well, maybe not the laziest, but this might come close. 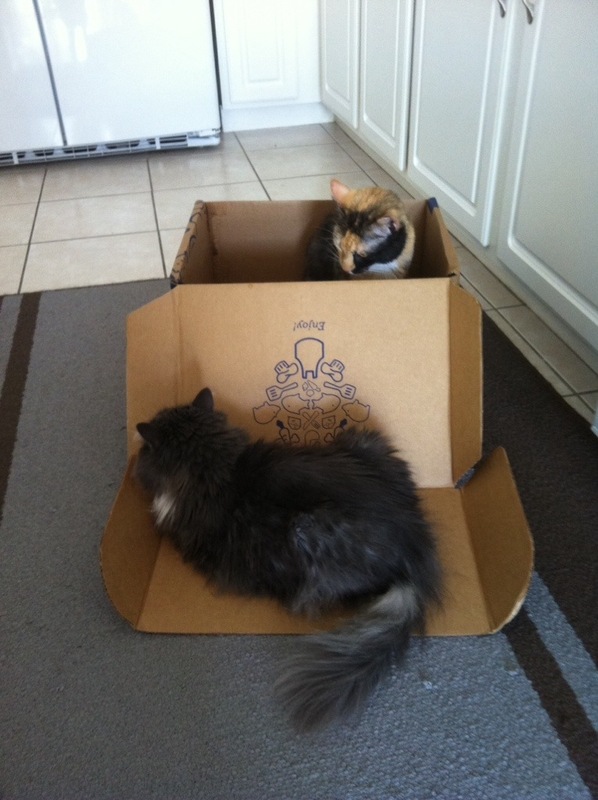 Bob and I love our Hello Fresh boxes. They are like a mini Christmas present every week. The food is exactly what they say – fresh and good quality – and I can get dinner together in 45 minutes. I don’t have to worry about missing an ingredient, not knowing the recipe etc. With this in mind, and knowing what the next six weeks looks like. I decided to try a second company -Blue Apron. I went with a basic four week ‘gift’ so there would be no automatic subscription and I wouldn’t have to worry about canceling at the end of this. I set the delivery date for later in the week, but now we have dinner taken care of. It feels lazy. It feels like I’m cheating, but honestly, I don’t want to eat out all of April and I just know I’m not going to have the mental capacity to get it together. Heck, I stared at the tomatoes on the counter for a good 20 minutes is week trying to figure out how I was going to stuff them. I knew, I had it planned out I just could not get started. So we will see how is works. 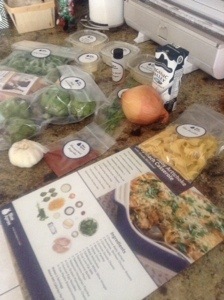 So far, I’m not as impressed with Blue Apron as I was with Hello Fresh, but it is still first impressions. I’m try to get some pictures of different meals; try. Hope everyone has a great week! 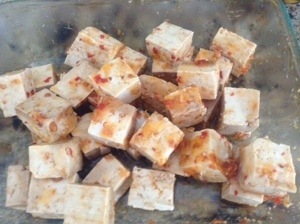 I’ll let you know how the tofu experiment turns out.